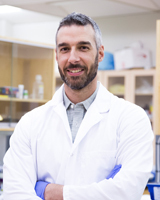 Dr. De Lisio is a molecular exercise physiologist with a particular interest in stem cell biology. The mission of the laboratory is to optimize endogenous stem cell populations through lifestyle modifications to maintain tissue regenerative capacity throughout the lifespan. Work in our lab is focused on determining how external cues (i.e. exercise, mechanical strain, nutrition) regulate mesenchymal stem/stromal cell fate and immunomodulatory function in obesity, cancer, and cancer-related therapy. We take an interdisciplinary approach combining in vitro, animal, and human models, and applies techniques from molecular biology to systems physiology.